Billed as the perfect jumping on point! A new story! A new arc! At the height of 1970s Britain, MI-6’s covert “Ninja Programme” has just activated its first female agent: NINJA-G! This issue explores her background, and I'll let you in on a secret...its pretty enjoyable. Often you hear about a new issue is a perfect jumping on point, but this issue lives up to the billing. 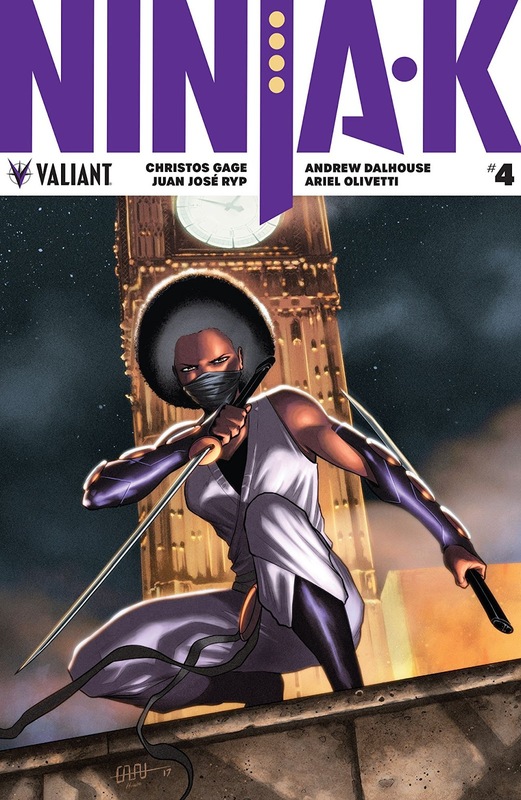 Firstly, it is a standalone story in a way, the background to Ninja-G. Not only is she stylish, but she has the moves to boot, as she makes her way to the top of the British MI-6 group of deadly agents. We see how she is manipulated by the British establishment to further their interests, until she realizes that it was her MI-6 handler that killed off her love interest, framing Ninja-G's Russian counterpart. Then the action gets pretty bloody and gory, as she seeks revenge for MI-6's betrayal. Actually to be fair it was pretty gory before that too (I especially liked the panel that depicted the English girls finishing school that taught decapitation lessons). The action then ties up to the modern day through the admission that Ninja-G's whereabouts was established through the use of Psiot abilities. It is a pretty neat way of bringing the focus back to the current events in the Valiant universe. 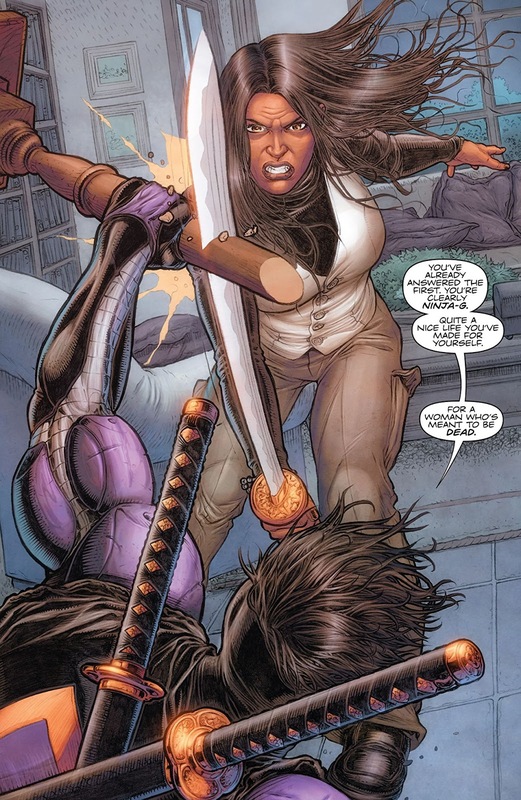 Incidentally, I did have a laugh at this issue, both in terms of the Russian enemies now seeming quite quaint, and also at the unlikelihood of a blaxploitation-Pam-Grier-Ninja babe infiltrating 1970s IRA cells - but it was the good kind of "far-fetchedness" that I like in comics. 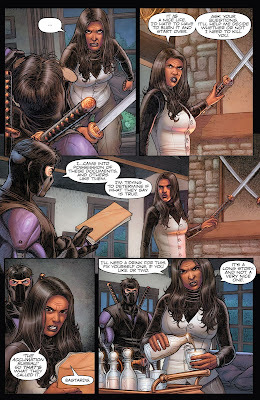 Also should mention that a trip to the household of a now domesticated "retired" Ninja assassin had some nice Kill Bill echoes! This was a pretty good issue, it was packed with drama, action, blood and gore, clever dialogue, and some nice ideas. It kept things neat and tidy for new readers and allowed them a hook by which to enter the title. The art was good, if not dazzling but there were some pleasing panels along the way. 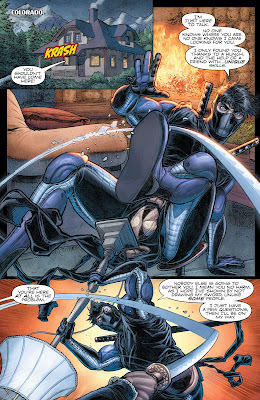 Worth a go, and a nice way to slip into Valiant. The art has been so great on this title and the story never seems to bog down even the mini stories in the back are adrenaline filled. Great review!